In the example I use in the video, we're pretending that your gross margin is 89%. What this means is that for every dollar you sell, you get to keep .89 cents to pay for the overhead costs in your company. In order to help you get a grip on your break-even point, I would suggest you watch last week's post titled "How to Calcualte Gross Margin" first. It's a 60-second video that walks you through a ficticious example of a company and its gross margin. Overhead costs are the costs that you incur within your business even if you don't sell any products or services for the month. Examples include rent, insurance, administrative payroll, marketing, and more. Add up every dollar that you spend each month to get a total overhead cost. Hint: In this equation, most people cut out marketing which is a big no-no. You need to calcualte your break-even point with a marketing budget built in so that your company can grow. They do this becuase if things get bad, they often cut marketing first as a way to save money. Wrong. Wrong. Wrong. And wrong again. Let's pretend that you have overhead costs of $25,000. Balance sheet payments are things that you must pay for each month that are not classified as an expense in typical accouting terms. Examples include the principal portion of loan payments, payments to investors and shareholders, and owner draws. Lets pretend you take an owner draw from your company each month of $5,000 and you have an additional $2,000 that you pay in principal payments on debt. Your balance sheet payments are $7,000. 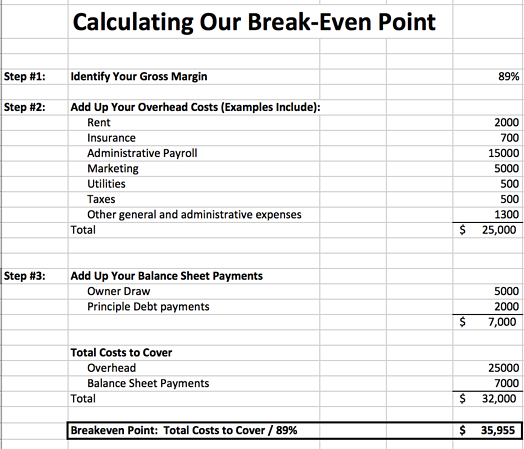 Learning how to calculate the break-even point for your business is simple once you have the right data. If you think about it, this makes sense. In our gross margin video, the company made blender bottles and beard oil with a margin of .89 cents. If the company gets to keep .89 cents for every dollar it sells, then it would have to sell $35,955.05 in order to cover overhead and balance sheet payments of $32,000. Once you know how to calculate the break-even point, you may find yourself in a cycle of "meeting expenses". I work with a lot of entrepreneurs who are living paycheck to paycheck. Their sales barely cover their expenses because they're trying to "hit" their break-even points. If you want to escape this, I would suggest checking out our post on The #1 Profit Coaching Tip: The 90/10 Rule.